The years between the collapse of the Roman government in Britain in the early years of the fifth century and the arrival of St Augustine at the end of the sixth included a period of significant change. During that time, the physical character of the people and their language and institutions were completely altered . A Germanic people replaced the Celtic British, or at least became a significant dominating factor over the population of lowland Britain . Germanic dialects replaced Latin or Celtic and loose-knit and feuding hereditary kingships replaced the more centrally governed Roman provinces. Because this change took place while the Germanic immigrants were pagan and illiterate, the process was not well recorded . Traditionally, the first recorded Germanic warband arrived in Britain in the mid-fifth century [although other, Germanic, groups already existed in the country, recruited by Rome as foederati]. They were to serve as mercenary troops at the invitation of the British sub-Roman government. When the government failed in their agreement to supply them, these troops revolted. This revolt touched a significant part of the country. Then the first settlers invited their relatives from overseas to join them. At the beginning of the sixth century, the Germanic peoples' rapid spread through the country was checked for a time by the British, but by the mid-sixth century they started to expand again. By the time of Augustine's arrival, they controlled much of the lowlands and were expanding to the north and west. The Celtic people used the name 'Saxon' generically to describe all of the Germanic people they met. While this likely indicates a heavy proportion of Saxons in the early raids and settlement, many other tribes were involved. Significantly, Britain came to be called England after the Angles rather than Saxony . Both British and English literary sources describing the arrival of the Germanic tribes in the fifth century are available, as are sources from outside the country. The majority of these sources are distant in time and space from the events they are describing and therefore need to be treated carefully. De Exidio Britannae, written by the monk Gildas in the mid-sixth century, is the nearest to a contemporary source that is available. However, Gildas' purpose was to call the rulers of his day to repentance, not to write history. Where he does discuss historical events, Gildas should be treated as telling the truth as he understands it. The people he was writing for would be aware of the events he was describing and it would have defeated his purpose to distort the truth. Gildas knew of the British appeal to Aëtius and of the settlement of the Saxons as federates by a 'proud tyrant' . He also correctly uses technical terms such as epimenia and hospites that indicates possible access to official records . From internal evidence, most sources place Gildas' birth forty-four years after a battle at Mount Badon which is generally dated around AD 500 . Ian Wood however, believes that Gildas is saying that from the time from Ambrosius' first victories to Badon was 43 years, and that one month had passed since Badon, which would date Gildas' writing to about 500 instead of 540 . Opposing this theory is the apparent fact that Gildas was writing when Maelgwn, the British king of North Wales who died about 547, was still alive . Therefore, a mid sixth-century date is most likely. The Historia Brittonum by Nennius is the second British source. Nennius was probably writing in the ninth century. His work was not well organised, but it contains some information not found in other early sources. Bede, who completed his History of the English Church and People in 731 is one of the better sources of information because he took a great deal of care to correlate and date his information. Meyres, The English Settlements, p1. The sources use different names to describe the pre-invasion population and the Germanic invaders who came to control them. For this paper, 'Roman' refers to the native population prior to the end of Roman administration, and 'British' refers to the pre-invasion native population of Britain after the end of Roman administration. 'German' or 'Germanic people' is used to describe the invaders and 'English' is generally used for Germanic people who settled in what was to become England. In addition, Germanic tribal names are used where appropriate. Gildas, The Works of Gildas, p310. Ian Wood, The End of Roman Britain: Continental Evidence and Parallels, p23. Bede was an eighth century monk in Northumbria where scholarship was flourishing at the time in which he wrote. He had good information regarding Kent through the church and was also associated with the Northumbrian royalty . Since the Frankish princess Bertha, who married King Ethelbert of Kent around 560, brought a Frankish bishop with her as chaplain, it is possible that written sources from that time period were available to Bede. Reference to the regnal years of the Roman emperors in some of Bede's writing bears witness to the antiquity of his information. Bede was relating the common traditions of his time, correlated with written church documents when possible. It is unlikely that he was fundamentally mistaken in most cases . Bede primarily used Gildas for his early history, adding additional data from king lists that were available to him. He also included the Continental background of the English people as he understood it . The Anglo-Saxon Chronicle was compiled in the court of King Alfred the Great of Wessex late in the ninth century. The early entries in the Chronicle come from the oral traditions of the West Saxon (Wessex) kings, probably in the form of heroic poetry, which has been artificially fitted into an annalistic format. The dates in the chronicle are likely to be the conjectures of the annalist writing three hundred years after the events occurred . These dates are at best traditional, and at worst arbitrary . An apparent duplication of the stories describing the landings and battles thirteen years later of Cerdic and Cynric and Stuff and Whitgar suggests that a double tradition of the same event is being described, separated by one Easter cycle of nineteen years. This would explain the lack of a protracted war in Gildas . The difficulty in placing some of the battles described in the chronicle is another indication of its antiquity. In describing the battles in Kent after the arrival of Hengist and Horsa, places such as Ypines Floet (Ebbsfleet?) and Aguiles Threp (Aylesford?) can only be located using other clues within the text . There is a Latin version of the Anglo-Saxon Chronicle, Ethelweard's chronicle, which seems to contain information from other sources as well. At times, this can be used to supplement the Anglo-Saxon Chronicle. Most of the regions of England that are discussed in this report are shown in Figure 1, below. Frank M Stenton, Anglo-Saxon England, pp10-11. All of the above sources use the Adventus Saxonium of approximately AD 450 as the beginning of the English settlement in Britain. This may be because the Adventus was the first event the process that could be dated . Nevertheless, archaeological evidence indicates that the primary authors are describing the end of the migration process, not the beginning. In addition to British and English sources, the Byzantine historian Procopius provides some information about Britain which he evidently received from Angles in a Frankish delegation to the Emperor Justinian. Zosimus, writing in the sixth century, knew that the Emperor Honorius had declined a British request for military assistance . The Vita Sancti Germani relates the visits of Germanus to Britain as late as the 440s to discuss theological issues. It provides a picture of Britain in this time period. When Germanus visited, the island was still governed by the Romano-Britons. Germanus' meeting with the British was interrupted by a Saxon raid, but was not seriously influenced. Other saints lives provide information which confirms Gildas' description of the abandonment of towns and the degradation of life in general. St Thadeus is described as visiting a villa near Chepstow where the owner was attempting to provide heating for his bath, but only on weekends. Many British towns may have resembled the deserted Roman town in Brittany which was visited by St Paul Aurelian. St Cuthbert is described as sightseeing in deserted Carlisle . An increasing amount of new information about the transition period is being supplied by archaeology. The evidence from first-hand archaeology is free of errors that have been induced by copyists and editors, but is susceptible to improper interpretation and must be used carefully. The chronology of English artefacts requires the correlation of evidence found in England and that of the Continent, and with coins or other materials that can be accurately dated. From this a rough chronological sequence has been developed based primarily on changes in the styles of pottery and jewellery . In general, the recovered artefacts are grave goods, many of which tend to be durable. It is necessary to look at all of the grave goods for chronological indications, as heirlooms and plunder may have been be included in graves. Sequences of pottery, brooches, buckles, and spear heads are now reasonably well established for dating . In addition to chronology, pottery, and brooches particularly can be used as evidence of Continental homelands for immigrant groups. There was a gradual transition from cremation early in the settlement period to inhumation as the English were influenced by British customs, and particularly as they were introduced to Christianity. This happened both in England and on the Continent. Therefore, cremation indicates an early grave. Pagan inhumation burials were generally supplied with grave goods which makes them excellent sources of information. Archaeological artefacts of the sub-Roman Britons are difficult to find. They appear to have continued to use the durable goods produced in the Roman period as long as possible and then replaced them with goods of less durable leather and wood construction. In addition, on sites that were abandoned, the latest levels are the least well preserved. It requires specialised techniques to recover the upper remains of wood construction. However, when allowances are made, the archaeological record still shows a drastic reduction in population and the standard of living of those British who remained in south-eastern and central England . Archaeological evidence indicates that there were Germanic troops in what became England well before the fifth century . The Romans used auxiliary troops from all over the world to provide garrisons for their military installations. Thanks to Roman records, we know that German troops were stationed on Hadrian's wall. These troops did not leave identifiable artefacts because they were issued with Roman equipment. By the fourth century, the Romans were enlisting Germanic troops who were following their own leaders and with their own equipment. Artefacts show that Germanic troops were guarding towns and roads in England from the fourth century on. Much of the pottery that identifies Germanic people has been found along the Saxon Shore where it appears that auxiliary troops were stationed. Cremation cemeteries have been found which date from before the end of Roman rule in Britain. These early cemeteries are generally concentrated near Roman towns, forts, or transportation routes. Their location pattern is similar to that of a wheel-made pottery style which was decorated in Saxon styles, called Romano-Saxon ware. This pottery was apparently made by British potters for the Germanic trade . 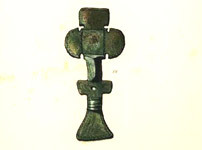 Brooches, commonly used as clothing fasteners, provide a valuable indication of date and origin. 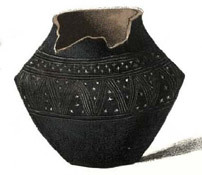 The shape and type of decoration varied between tribal groups. 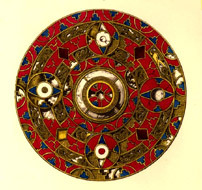 Round and equal arm brooches were common among Saxons, while the Angles and Jutes preferred cruciform brooches. In addition, wrist clasps were common among the Angles . Martyn J Whittock, The Origins of England: 410 to 600, p20. Pottery fashions have about the same division as brooches. The Angles and Jutes favoured rectangular decoration while the Saxons used more curvilinear styles. In addition, stamped decoration was common on Saxon pottery and was not used by the Angles and Jutes . Weapon ownership was almost essential in the settlement period and, therefore, weapons were commonly placed in graves. 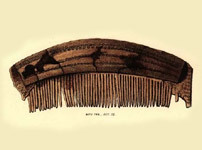 Spears were the most common, typically an iron tip riveted to an ash shaft. Shields of lime wood with a leather cover and an iron boss at the centre have also been found. Knives and swords were too valuable to be placed in the graves of ordinary soldiers and farmers and are therefore an indication of aristocracy. The swords which were used by many of the German nobility were heirlooms that had been passed down from generation to generation . Helmets and arrows were also rarely found. The sunken feature building was the most common type of housing to be associated with the English. At Sutton Courtney, a typical house was 3.5 metres long, 2.7 metres wide, and sunk half a metre below ground level . Burton Raffel, Beowulf, lines 794-797. English cities mentioned in this report are approximately located on the map in Figure 2, below. Place-name studies can provide additional information regarding the interactions of the people in Britain during the Germanic invasions, but must be used carefully. In general, place-name information is used to supplement other data and cannot be used alone to prove early origins. Place-names have passed through many changes from the fifth to the twentieth centuries. In an illiterate society, there is a need for many different place-names to avoid confusion, but names were not written down until at least the seventh century and a large number of them were first recorded in Domesday Book after the Norman conquest, meaning that they were further distorted by French-speaking clerics . Chronologically, place-names are not accurate within less than a fifty year span . Place-names with a Latin element indicate that contact between settlers and Latin speakers was still taking place. Wic (vicus), ecles (eccles) and funta (fontana) are examples of these. Wic, especially when combined with ham, probably indicates a settlement which was associated with a small Roman site, vici. Three-quarters of such places are within one mile of a Roman road and half are close to known Roman villages or villas . Ecles, from ecclesia, implies the survival of at least the recognisable remains of a Christian church and funta suggests a location near a Roman site with a fountain . Vera I Evison, The 5th-Century Invasions South of the Thames, p5. Place-names ending in -ham, -ingaham, and -ingas are indications of Germanic settlement. Ham refers to a settlement, ingaham the settlement of a particular people, and ingas was a clan designation. Some place-names preserve the names of pagan deities. Frig, Grim, Thunor, Tiw, and Woden are all known . Their locations are in the east and south where the earliest settlements are found. Any place-name with such pagan connotations certainly indicates a pre-Christian origin, or else such a late date that the pagan implications had been forgotten. Unlike Gaul where they have been preserved, the Roman estate names have been lost in England. This indicates that hospitalitas was probably not used to support mercenaries and soldiers as it was in Frankish Gaul . Place names of British origin in the lowlands are confined to natural features that would require immediate identification which was intelligible both to newcomers and natives. These indicate a survival of the native population in some status. A few town, port, and fortress names of Roman origin were taken over with little modification. These are generally shoreline locations, or other large facilities which would be familiar to merchants and seamen. Many are combined with another loan word from Latin, castra: in its English form caester, which later became either cester or chester, such as in Winchester, which was Roman Venta. 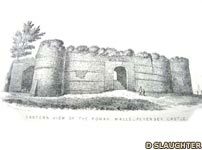 Others were simply recognised as a fortified site, but the Roman name was lost, such as Chester or Castor-on-the-Wolds . Stenton's reservations regarding place-names in 1940 are still true today, 'conclusions... fall far short of scientific precision' . Tacitus placed the Saxons at the neck of the Cimbric peninsula in modern Holstein around AD 100. Ptolemy placed them in the same place in the mid-second century . Between about 250 and 450, at least some of the Saxons moved westwards along the coast and settled amongst the Frisians in their mound villages . After defeating Syagrius and his domain of Soissons in 486, the Franks controlled northern Gaul and were able to keep other barbarian groups out. In the last two decades of the fifth century, Frankish strength probably forced the Germanic tribes that wished to migrate to go to Britain instead of Gaul . Using information from Frankish sources, Procopius described the inhabitants of Britain as Angles, Frisians, and Britons . Procopius' Frisians were probably included with the Saxons in British sources . There is an Anglo-Frisian pottery that is commonly found in south-eastern cemeteries in Britain, but no Frisian kingdoms or institutions developed which may be why Bede ignored them . Bede stated that the invaders came from the Continental Angles, Saxons, and Jutes . It is likely that Bede was reducing a very complex situation to simple terms. Bede placed the Angles to the north of the Thames, the Saxons to the south of the Thames and in Wessex, and the Jutes in Kent and on the Isle of Wight. For Bede, the Angles came from Angulus, modern Schleswig which still has a district called Angeln. The Saxons came from the coast between the Elbe and the Weser valleys, and the Jutes resided to the north of the Angles in Danish 'Juteland' or in Holstein . Other literary sources indicate the possible presence of Franks among the immigrants. Archaeology also indicates that Swaefe (Suevi), Alemanni, Swedes and Danes were present. This is not surprising if we assume that the Volkwandering caused a high degree of cultural mixing between the Elbe and the Ems where most of the settlers in Britain originated . Mound villages have been excavated in the Netherlands and Germany that indicate significant growth during the migration period. Feddersen Wierde to the north of Bremerhaven had a number of small mounds that were linked together in the first century AD to support about thirty houses. This was increased to about fifty houses in the second century. Later, bronze and copper working installations were added. Occupation ceased in the mid-fifth century. Since pottery found at Feddersen Wierde is similar to that found at Mucking on the Thames, it is tempting to conjecture a migration from this site to England. Other mound villages that have been excavated tell a similar story . Stenton quoted in Meyres, Settlements, p45. Bede, A History of the English Church and People, Penguin, p56. Archaeological evidence, in the form of saucer brooches and Saxon pottery, shows that Saxon settlement occurred in the eastern and southern part of Britain in the fourth century. At that time, pagan cremation cemeteries in the north begin to appear in conjunction with Roman sites. Coastal forts were built for protection and the Roman title 'comes litoris Saxonici' came into being in the late fourth century, possibly as early as the visit of Constans in 343. In 372, the Alemannic king, Fraomar, was sent to Britain as a tribune either to command tribesmen being moved with him, or perhaps those that were already there. A few chance archaeological discoveries in the north indicate Alemanni presence at this time . Sunken feature huts set back from the Roman period street in Canterbury are evidence of Germanic troops inside the city in the fifth century. Dorchester-on-Thames has similar huts and also an associated English cemetery outside the walls. Since continuous occupation is indicated in many sites, it appears that some towns may have passed directly into English hands during the revolt in the 450s . Gildas described the breakdown of order following the gradual fourth century withdrawal of Roman forces and the dismissal in 409 of Roman administration. Scots and Picts on the former frontier raided in Britain and the people were unable to control them . An appeal for aid was sent to Aëtius in Gaul, but the Romans were too busy with troubles of their own and were unable to help . The British leader whom Gildas called a 'proud tyrant' arranged for a Saxon warband under Hengist and Horsa to settle in the country as federates for protection against the Scots and Picts. Nennius implies that the government officials who hired the Saxons not only feared the Scots and Picts, but also the Romans in Gaul and Ambrosius in Britain . If Vortigern, the proud tyrant, was a leader of the Pelagian party in Britain, that fear would be understandable . When hard times came and the government was not able to meet its obligations to the Saxons, they revolted and ravaged the countryside. Under the leadership of Ambrosius Aurelianus, the British eventually fought back and reached a stalemate after a battle at Mons Badonicus which resulted in a generation of peace . Ambrosius' likely power base was Wiltshire where the place-name Amesbury suggests the 'stronghold of Ambrosius'. At the time in which Gildas was writing in the 540s, he felt that this peace was threatened . 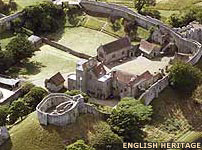 The capture of Old Sarum by Wessex in 552 may have ended Gildas' period of peace . Continental evidence suggests a reverse migration of Germanic people out of Britain during this time . Also notably, there is no activity in Kent from 473 until 565 in the Anglo-Saxon Chronicle. Nennius, History of the Britons, p396. Meyres, Settlements, p15. For more on the Pelagian problem, see The End of Roman Britain. Tranlatio Sancti Alexandri quoted in Stenton, England, 6; Anglo-Saxon Chronicle, pp12-16. Gildas made no mention of the British hero Arthur. Since his battles are reputed to have taken place during this time, Gildas should not have ignored him if he had been as famous as indicated by Nennius and later Geoffrey of Monmouth  - but ignore him he did. The later legends of Arthur appear to have developed out of late Welsh legends that suggest a British commander called Artorius won some repute against the Saxons . Literary sources indicate that Kent was initially settled on a federate basis. Hengist and Horsa originally came with a warband in three ships in 449 . Gildas refers to the original settlement on the 'east side of the island... and there fixed their sharp talons' . 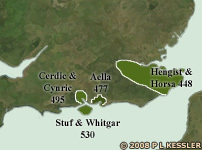 Nennius clarified that this first settlement was on the Isle of Thanet, but records the year as 447 . Ceramic discoveries on Thanet supports the presence of an early Germanic settlement there . The immigrants were reinforced by their relatives from across the sea and by 456 when their provisions were not supplied as agreed, they revolted against their employers . Nennius and the Anglo-Saxon Chronicle both indicate the early fighting was primarily confined to Kent . Gildas probably compresses a much more complex series of events when he speaks of the revolt covering the whole island . The years 450 to 460 seem a reasonable date for the English takeover of parts of Britain. We know from the Vita Sancti Germani that the British controlled the island as late as the 440s. In 455, the British church altered the date of Easter in line with a Continental change, but the change thirty years later was not followed in Britain. Therefore, contact with the Roman church was lost during that period . Nennius, History, 408; Geoffrey of Monmouth, Histories of the Kings of Britain, pp155-200. Anglo-Saxon Chronicle, According to the Several Original Authorities, p11. Anglo-Saxon Chronicle, 12; Gildas, 'Works', p311. Nennius, History, 404-405; Anglo-Saxon Chronicle, pp12-13. Archaeological evidence indicates that a mixed band of settlers came in the mid-fifth century and were reinforced until early in the sixth century. The immigrants in Kent are hard to identify because Roman and Gaulish influence was the strongest there and so newcomers were influenced by both. Bede indicates that Kent was settled by Jutes, but this may simply refer to the leaders who developed the ruling class . Evidence in London indicates Roman activity in the early fifth century when a riverside wall was rebuilt. A collapsed bath house indicates a discontinuance of use later in the fifth century . In the immediate post-Roman era, Saxon and Frisian merchants apparently settled outside the city walls, between the Roman road and the river in the Westminster area. The Roman town was not reoccupied by the English until the mid-sixth century . Based on grave evidence, Vera Evison argued that Frankish settlers were responsible for the settlement of much of south-eastern England. This position was not well supported by other evidence . In any case, the Frankish element of the population remained a small, but noticeable, minority . Kent certainly did have a more elaborate culture than other English settlements and there are traces of connections with the Franks, but an overwhelming presence is not supported by linguistic evidence or the fact that Kent remained pagan until St Augustine came in 597. Frankish control after the time of Clovis should have also brought in the Christian church . Legally, the lower class in Kent had a higher status than in the other English kingdoms. The wergild of the highest class of peasant was one-third that of a nobleman as opposed to one-sixth in the rest of the country. This may be due to the different nature of the conquest of Kent . The class of people called laets in early Kentish law codes could derive from Roman laeti, mercenaries settled on agricultural land with military responsibilities. They could be the higher class of peasants illustrated by the higher wergild. In later law codes the laets merge with the ceorls . Stenton, England, 10; Meyres, Settlements, p126. 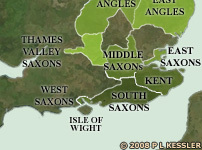 Sussex had no natural administrative centre in Roman times. It was probably administered from Chichester on its western edge. The defence of Sussex in late Roman times was based on the shore fort at Pevensey, called Andredecaester in the chronicle. Chichester itself shows no sign of occupation from the fifth century until the ninth . In 477, three ships landed at Commensurate, now the Owners Banks, under a leader called Aella. They drove off the British and quickly dominated the western part of the region. Eight years later they were fighting again at Mearcredesburna which can possibly can be interpreted to mean 'stream of the agreed frontier' . In 491, Aella and his son Cissa captured the shore fort at Pevensey and massacred the British inside . This appears to mark the final collapse of the Saxon Shore defence system in Sussex. Bede referred to Aella as the ruler of England south of the Humber and gives him a title: 'bretwalda'. The original title was probably brytenwealda, which mean wide ruler. It appears to have been a Germanic title given a king who had power over lesser kings . From the sources available to us, it is not apparent why Aella was given that title. Archaeology reveals an early use by the English of the Romano-British cemetery at Ringmer. The majority of the graves contain inhumation burials which either points to late colonisation or close contact with the British population. Saucer brooches found in the graves indicates the presence of Saxons from the Elbe-Weser area. A cemetery at High Down behind Worthing also contains evidence of Saxon mercenaries toward the end of the Roman period near, or in, a prehistoric hill fort. Continued occupation through the fifth and sixth centuries is indicated . Other artefacts point to a mixed Saxon/Jute/Frankish population . Parallel fashions in saucer brooches north and south of the weald and in the upper Thames Valley could be an indication of Aella's widespread influence as reported by Bede. Settlement of the upper Thames from Sussex is possible by way of the Roman roads through the weald. The earliest Germanic inhabitants in what would later be Wessex appear on the upper Thames. By the late fifth century much of the Thames Valley had been settled by Saxons. Romano-Saxon pottery evidence indicates that there were Germanic troops at Abingdon and Oxford before 410 and the defence system around Roman Silchester was expanded between 410 and 450 . This area was settled well before Cerdic and Cynric are said to have landed in the Southampton waters in 495. At the time they landed, Cerdic and Cynric were referred to as ealdormen . During King Alfred's reign, when the chronicle was written, an ealdorman had regional military and civil authority. This could indicate an understanding by the chronicler that they already had administrative power under British authority. The Wessex line of kings was different from most others in its use of British names for its leaders. Cerdic is one of those, as is a later king, Caedwalla. Archaeologically, Wessex has little evidence of early Germanic settlers. J N L Meyres suggested that Cerdic was the head of a partly British noble family, with blood ties to existing Saxon or Jutish settlers who had been entrusted with the defence of Wessex in the last days of British sub-Roman authority. Once effective Roman authority had vanished, the family eliminated competing British chieftains such as Natanleod, reported killed in 508. A change in their status is reported in 519 when they 'assumed the kingdom' . If that were true, the lack of archaeological evidence of Germanic settlers in south Hampshire would be explained. There would be no need for an influx of settlers at this time as military power rested on assimilated settlers and allied British natives who were already in place . The battle record in the chronicle agrees with Gildas' description of the first half of the sixth century. The West Saxons seem to have been confined to a very limited area around Southampton Water until Cynric captured Old Sarum in 552. British Silchester appears to have been occupied into the early sixth century . It was not until late in the sixth century that kings of Wessex combined with the Thames Valley Saxons and were operating in that area. Verulanium (St Albans), to the north-west of London, appears to have been occupied by the British throughout the fifth century . The law code of Ine confirms the presence of free British citizens in Wessex in the seventh century. In this law, British slaves have a wergild of fifty shillings and British landowners are worth 600 shillings. This indicates the presence of British landowners in Wessex over one hundred years after the beginning of the Saxon conquest . The earliest Germanic settlements in East Anglia seem to have been on an orderly and cooperative federate basis. Caister-by-Norwich, Roman Venta Icenorum, was originally built to Romanise the Iceni after Boudicca's revolution in AD 61. Although the sea has long since retreated from the Roman shore fort at Pevensey in Sussex, it is thought that Ælle executed a naval attack to capture the stronghold in 491. At about the beginning of the fourth century, an area to the south-west of the city began to be used for an Anglo-Saxon cremation cemetery. At this time, pottery evidence indicates a mostly Saxon mercenary population living in cooperation with the British citizens in the city. York, Leicester, Cambridge, and Great Chesterford have similar cremation cemeteries outside their walls . Cooperation appears to have broken down in the fifth century. Immigration increased significantly after the Saxon revolt. Large cremation cemeteries demonstrate non-Christian attitudes among the newcomers. Many fifth century settlements were not directly related to Roman centres, indicating an independence not evident in earlier settlements . The division of the area of East Anglia into Norfolk and Suffolk indicates that it may have initially been settled by two separate groups who were later united by the Swedish Wuffing dynasty whose burial ground was at Sutton Hoo . There is no literary record of the settlement of Lindsey except for the king list. The first name on this list that is free of mythological reference is probably Winta, dated to the mid-fifth century. The place-names of Winteringham and Winterton north of Lincoln on the Humber may relate to him. Whittock, Origins, 161-163; Meyres, Settlements, p111. The Roman fort at Lincoln has survived and the fact that no cremation cemeteries are found nearby may indicate a British presence until a late date . This would explain the retention of the original Roman name at Lincoln. The Roman forts at Horcastle and Caistor-on-the-Wolds both have very late Roman and very early Saxon materials and large associated cremation cemeteries that date to the early fifth century. If Winta and his people entered Lindsey from the Humber in the mid-fifth century, they probably found the area already occupied by Germanic settlers, the descendents of laeti settled earlier as garrison troops of the Saxon Shore forts. One of the sixth century kings of Lindsey had a partly British name, Caedbaed. This may indicate a peaceful combination of the original British citizens, the garrison troops of the fourth century, and later immigrants . The first Angles arrived in Deira when Britain was still a part of the Roman Empire. Germanic troops were used to guard military centres and communications routes. Pottery remains tie some of these troops to Anglian Schleswig. Other tribes were also present as indicated by Saxon, Anglo-Frisian, and Alemanni artefacts . The place-name, Almondsbury, may be associated with the Alemanni . Cremation urns at Sancton and Saltburn and inhumations at Catterick and Seamer indicate a long-term Germanic presence. British tradition claims that York was ruled by Celts until the battle of Caer Greu in 580, so the Germanic troops in York may have been in British service . King Soemil is mentioned as the king who first separated Deira from Bernicia. Soemil is six names in the Deirian king list above Edwin who died in 635, so he probably lived in the mid-fifth century. Since Bernicia did not exist until later, the separation mentioned could have indicated independence from the British authorities in the northern frontier area that eventually became Bernicia . The cemetery at Sancton contains thousands of burials over an area of at least thirty acres. The earliest burials were cremations with an increasing proportion of inhumations in later graves. The latest burials, all inhumations, were adjacent to a medieval church and probably occurred after the conversion to Christianity in 627. This cemetery appears to have been in continuous use for about two hundred fifty years . It provides a strong argument for a long term, continuous presence of Germanic people in Deira. Pottery from the Sancton cemetery has parallels in Anglian Schleswig and Fyn which date to the late fourth and early fifth centuries. This very early date supports the presence of Angles and Saxons as laeti in cooperation with the British authorities . An increasing transfer of political power to German settlers probably met British resistance based on the northern British kingdoms. The Goddodin poems, which relate a disaster on a British campaign during this struggle, probably date to the late sixth century . The area between the Thames and the River Lea was probably in British hands until late in the sixth century. 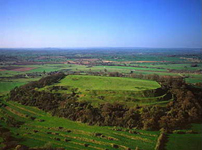 Cuthwulf of Wessex is said to have captured the area in 571 after the battle at Bedcanford . Large cremation cemeteries around Leicester indicate a laeti settlement associated with the British city. Since Leicester's Roman name, Ratae Coritanorum, did not survive, a period of abandonment between the British and English settlement is indicated . The cohesion of an English kingdom in this area was very late. The hostile relations between Edwin of Deira and Cuichelm of Wessex show that no independent power lay between them as late as 625 . The primary literary sources leave the impression that the Romano-British urban and rural lifestyle was replaced by Anglo-Saxon invaders starting in the mid-fifth century. Gildas, Procopius and the West Saxon annals all suggest a conquest in two parts separated by a significant length of time. All of the sources give a mid-fifth century date for the beginning of the first phase when warbands migrated into Britain either after being invited by the British authorities as in Kent, or on their own as in Sussex and Wessex. The West Saxon traditions indicate that the later phase of conquest started about 552 after a twenty-five year period of consolidation in Hampshire. From the British perspective, Gildas indicates at least forty years of stability, but says that border skirmishes were taking place during that time and, therefore, does not significantly disagree with the chronicle. From this it can be seen that the literary sources paint a relatively uniform picture. The extent of the English penetration of the island in the fifth century as portrayed in the literary sources is shown in Figure 3. Archaeological evidence indicates a much more complex situation. A significant population of Germanic people of mixed tribal background was built up in cooperation with the Roman and British authorities during the fourth and the first half of the fifth centuries. 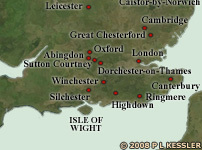 These settlements appear to have supported the Saxon Shore defence system that was constructed during the fourth century. A comparison between Figure 2, which shows locations with archaeological evidence of early Germanic settlement, and Figure 3 reveals the southern bias of the literary sources who say nothing of early settlement in Essex, East Anglia, Lindsey, Deira, or the middle Thames region. The political collapse on the Continent led to the final dissolution of Roman military and civil authority in Britain in the first half of the fifth century. It appears that an administrative and economic collapse quickly followed. This is the point where the primary literary sources pick up the story. With a centrally-organised Romanised army gone, the British were vulnerable to attacks by the irregular forces that were left behind. When the British authorities were no longer able to supply the auxiliaries with the amenities they had come to expect, they took matters into their own hands, supported by warbands from the Continent. The concentration on the south and east in the literature may be due to the accidents of survival of oral traditions, or it may be that the transition in these areas was more violent than elsewhere, and therefore it was recorded in the heroic poetry of the day, subsequently being passed on to later generations. Archaeological evidence shows that there were attempts at continued occupation in some cities. Gates were blocked up and, in some cities, German mercenaries appear to have been brought inside the walls for further protection. The cities of Silchester and Verulanium continued to be occupied by the British for many years, but in general the British population was significantly reduced. Many of the British aristocracy fled to the Continent or to the west and north, taking some of the peasants with them. Other British peasants probably remained, either trying to maintain themselves on the land, or becoming slaves to the invaders. With the fall of the cities, the villas also fell into disuse. Wide areas of the lowlands reverted to scrub and a completely different land use pattern appeared once they were reoccupied. In what had been the wealthiest and most densely populated areas of Roman Britain, the invaders completely replaced the language, institutions and culture of the Romans. In the west and north where native culture was less affected by the Romans, the Celtic language and culture was retained long after they became a part of the Germanic kingdoms. In Wales, much of the Celtic culture has been retained to this day. In some areas there appears to have been cooperation between the Germanic immigrants/invaders and the British population. Lincoln, in what became Lindsey, survived nearly intact. A high degree of cooperation seems to have been attained in Wessex where the ruling dynasty itself may have been part British (and perhaps even more so in Mercia). The puzzle regarding Wessex and other areas where cooperation apparently occurred is why more of the British language and culture was not assimilated. When written sources became available in the seventh century, these areas were Germanic in both culture and language. It appears that this area of study will remain a fertile field for historical controversy for a long time to come. Text copyright © William Bakken. Reproduced with permission.